Thornton Willis; Real Deal, 2012; oil and wood on canvas; 15" x 13" x 2"
UPDATE: Welcome readers from Painters' Table! On “Thornton Willis: Steps” at Elizabeth Harris Gallery, “Painted on 21st Street: Helen Frankenthaler from 1950 to 1959” at Gagosian Gallery, “Sanford Wurmfeld: Color Visions 1966–2013” at the Hunter College/Times Square Gallery, “Judith Braun: May I Draw” at Joe Sheftel Gallery, “Paul D’Agostino: Twilit Ensembles” at Pocket Utopia, and “Joe Zucker: Empire Descending a Staircase” at Mary Boone Gallery. Late into dinner with some art teachers a few weeks back, I impressed on them the urgency of what they do. Our conversation passed at a Twitteresque 140-character rate through much of what I’ve been thinking about recently, from the history of the Internet to the independent networks of New York’s outer-borough art scene. We talked about walking across the barren landscape of Saadiyat Island in Abu Dhabi, that pile of sand that might one day be a strip of museum franchises, and discussed the potential of massive open online courses—better known as MOOCs—to alter the landscape of education. One of the teachers described his interest in the microscopic views offered by the “gigapixel” images on Google Art Project and what it means to see in this new and unintended way. What keeps coming up for me is how quickly our landscape is shifting and what a challenge it is to keep up. The only certainty of the next few decades is that they will be nothing like the previous ones. As I leveled with the teachers at the end of our evening, it falls to their students to make sense of it all. Maybe it sounded a bit much, but I meant it. Artists have a power to illuminate what otherwise can’t be seen. Since I started following his work several years ago, Thornton Willis is an artist who has opened my eyes to the continued possibilities of paint as a means of illustrating the invisible. As an abstract painter, he is about as concrete as it gets. His simple designs of elemental shapes and bold colors become groundbreaking explorations, especially for the many artists who admire him. Willis is a painter’s painter, and if more people were to value visionaries over noisemakers, he certainly would be a household name. Until then, we should consider ourselves fortunate, because at least we can know his work. Willis’s latest exhibition at Elizabeth Harris Gallery may be his most focused to date.1 The son of an itinerant minister from the Deep South, Willis has followed his own artistic calling since first arriving in SoHo in the 1960s. His paintings combine geometry and an instinct to look closely at the particles of paint. Now in his current show, his large compositions have reached a new order of magnification, with shapes that are sharper and bolder than ever before. Willis is an artist who has long evinced an interest in physics and scientific research. These latest paintings are like his own Higgs boson breakthrough, revealing for the first time new building blocks of elementary forms. Thornton Willis; The Ceremony, 2013; oil on canvas; 72" x 60"
Willis breaks his shapes apart into free-floating zags and els. Drawing on his canvases from the 1970s, he creates an ambiguity between figure and ground, often by layering high-key complementary colors that give his paintings a radiant energy. The Ceremony (2013) resembles red lightning stepped across a black ground. The pencil marks inside also dematerialize the red forms, pulling the thick black forward. Willis brings a master’s hand to paint on canvas. He first maps out his shapes in thin acrylics. He then fills in with his own blend of oil and medium. This extra layer adds a shimmer to the forms and often leaves traces of his brushstrokes in the paint that seem wet and fresh but never greasy. The latest show also includes wall assemblages made of layered strips of painted wood. After seeing these tough little sculptures in the studio, I am glad Willis decided to display them in the show. They bring his structures into even greater relief. Here Willis has taken his painterly analysis and synthesized it—abstract vision made real. When it was revealed last year that John Elderfield would become a consultant to Gagosian, many speculated about the big fish this former chief curator of painting and sculpture at the Museum of Modern Art would pull in for the mega-dealer. The biggest so far has been Helen Frankenthaler, the great abstractionist who died in late 2011. 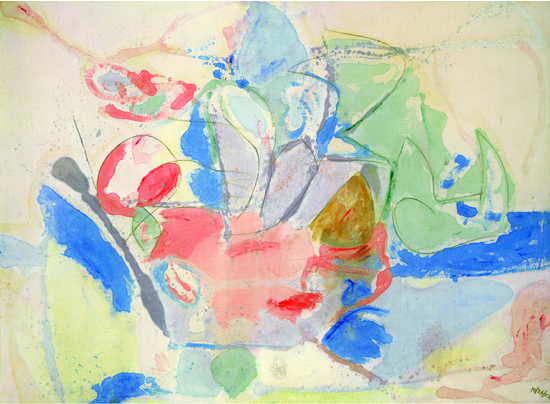 Elderfield’s first Frankenthaler show is now up in Gagosian’s soaring Chelsea gallery. “Painted on 21st Street: Helen Frankenthaler from 1950 to 1959” looks at the thrilling first decade of this artist’s career after she graduated from Bennington College, landed in the center of the New York School, and became a leader of its younger generation.2 This period includes the development of her “soak-stain” technique of applying thin oil onto unprimed canvas and the most famous painting of her career, Mountains and Sea (1952). Much has been made of the influence of this one painting, which is the center of the Gagosian show (so associated with the National Gallery of Art, this painting in fact is on extended loan to the institution from the Helen Frankenthaler Foundation). After seeing it in her studio in 1953, Morris Louis called Mountains and Sea “a bridge between Pollock and what was possible.” His visit directly informed what became known as Color Field abstraction in the 1960s. Painted on 21st Street (1950), a primed canvas of oil, sand, plaster, and coffee grounds, is a work of swirls and spills that feels like it literally came off the pavement of 21st Street. So too The Jugglers (1951), a flurry of color and forms that was “street art” before there was such a thing. Then there isEd Winston’s Tropical Gardens (1951), a long mural named after a popular nightclub that shows off Frankenthaler’s great smile along with her skill. Against these paintings, Mountains and Sea appears not as the perfection of a formal technique but rather as part of a fast and innovative cycle of production. Its freshness is why it still stands out as her best painting of the decade. By the second part of the decade, just as the stain allowed her pigments to soak into the canvas, so too did Frankenthaler’s voice get subsumed in the work. In the 1960s this fact revealed itself in brilliant canvases that wholly speak for themselves. In the late 1950s, at Gagosian at least, that voice often comes across as trapped halfway between the artist and the canvas soaking it in. “Color Visions” shows Wurmfeld to be far more than an optical painter, however much his rainbow gingham patterns might exercise the optic nerve. The standouts are those works that depart from the flat canvas. His colored columns from the late 1960s are mesmerizing crystals that bend in light. His “walk through” sculpture of translucent acrylic sheets from 1970 comes with its own warning—“sculpture may cause disorientation”—that should be taken seriously for the way its colored panels react when viewed together. Near the end of the show, Wurmfeld’s small watercolors of triangles and squares are intimate handmade gestures referencing early color-theory illustrations. Then there is the model of his “Cyclorama,” from 2009, a walk-in space that takes the nineteenth-century panorama into the twenty-first and the age of pure color. Two exhibitions on the Lower East Side show this alternative arts neighborhood at its best. For “May I Draw,” Judith Braun calls herself a “quantum amplifier” and limits her drawings with three requirements: “symmetry, abstraction, and carbon medium.”4 The results are swirling mandalas and radiant waves of graphite on paper. By imposing limitations, artists focus their work. With a visual mind and a steady hand, Braun best channels her results in the denser, blocked-in drawings with black backgrounds. She also captures the organic nature of symmetry in pointillist, spherical shapes that resemble luminescent deep-sea creatures. In a few examples, the exhibition hints at Braun’s most recent rule—to draw entirely with her fingers. Last year at the Chrysler Museum of Art in Virginia (and currently in the "Graphite" show at the Indianapolis Museum of Art) Braun created a mural landscape of fingerprints that brought to mind the animism of Charles Burchfield and revealed the flowering energy grounding all of her work. Paul D’Agostino is the Renaissance Man of Bushwick. Since 2008 he has run Centotto, one of the neighborhood’s more unusual galleries, out of his apartment. A Professor of Italian at Brooklyn College, D’Agostino is a translator of both language and art. For “Twilit Ensembles” at Pocket Utopia, D’Agostino creates “floor translations” by recasting paint stains found in his studio into fanciful narratives of graphite on paper and sculptures.5 D’Agostino’s strength is a conceptual one. Compared to the earlier work in the exhibition—which packs too much in a tiny space—this latest series shows the humorous side of D’Agostino’s mind. I was not entirely taken by the execution of the drawings, which seemed unnecessarily crude, but I like the way his work is unfolding. This is the second show at Boone to display Zucker’s labor-intensive technique, in which he hand-scores gypsum drywall into a grid, peels off the paper front, and colors the squares of powdery gypsum one by one. This time the images are flatter and almost entirely monochromatic, with less illusion of depth, and they work even better than before. The images of shaking columns now seem to speak less to a ruined scene and more to a ruined vision. The exhibition includes both square and tall, narrow works that are themselves columns seeming to hold up the gallery space. Whether he’s depicting shaking ground or altered vision, Zucker sees ahead by looking back, or maybe the other way around. 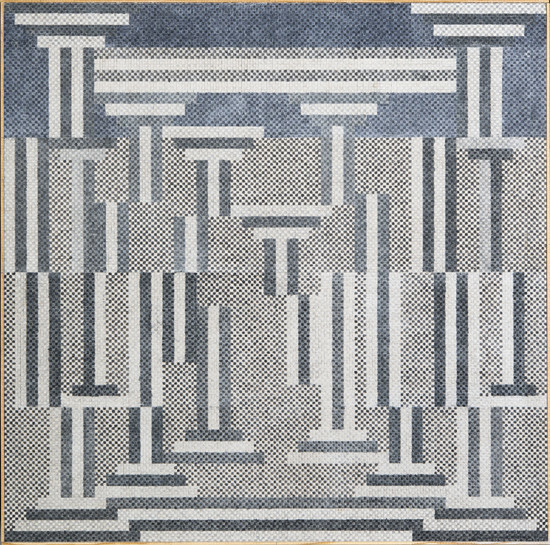 1 “Thornton Willis: Steps” opened at Elizabeth Harris Gallery, New York, on March 14 and remains on view through April 13, 2013. 2 “Painted on 21st Street: Helen Frankenthaler from 1950 to 1959” opened at Gagosian Gallery, New York, on March 8 and remains on view through April 13, 2013. 3 “Sanford Wurmfeld: Color Visions 1966–2013” opened at the Hunter College/Times Square Gallery, New York, on February 15 and remains on view through April 20, 2013. 4 “Judith Braun: May I Draw” opened at Joe Sheftel Gallery, New York, on March 3 and remains on view through April 21, 2013. 5 “Paul D’Agostino: Twilit Ensembles” opened at Pocket Utopia, New York, on March 3 and remains on view through April 21, 2013. 6 “Joe Zucker: Empire Descending a Staircase” opened at Mary Boone Gallery, New York, on March 1 and remains on view through April 27, 2013.